This review is going to be a bit different than most. The simple fact is, Guitar Hero World Tour cannot be reviewed strictly on its own merits; inevitably, any reviewer must compare it to the Rock Band games. Honestly, the games are very similar, and the co-op experience, especially, is pretty much the same. I think both are great, and I'm glad I own them. I'm not a fanboy either way, I just love music games and playing them with my friends and family. The games are different, though, in a few ways. We'll highlight these differences throughout the review. One of the most obvious differences is the instruments. I've had personal experience with most of the fake instruments that have been released. 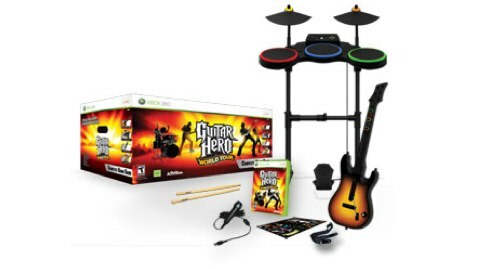 Notable exceptions are the Guitar Hero 3 Les Paul, and the Rock Band 2 Guitar and Drums. (My obsession, and budget, go only so far.) We were lucky/foolish enough to purchase the whole band package for Guitar Hero World Tour, including the drums, new guitar, and microphone. The microphone is pretty much the same as its Rock Band twin. However, the differences between the drums and guitars for the two games are much greater. I'll discuss the drums first. My initial impression was that the GH drum controller was a huge upgrade. The frame is far sturdier, and the entire thing is heavier than the RB1 drums. The RB1 drums are a bit floppy, and hard to pick up without the whole thing falling apart. No such trouble with the GH drums. The drum surfaces are quite different as well. I had modded my RB1 set with foam and felt pads to help soften the hit noise, which drove me crazy. The GH pads have a nice rubbery surface, with lots of bounce, and yet they are much quieter than the unmodded RB1 pads. Of course, the biggest difference is the raised cymbals, and the extra pad. This small addition, in my opinion, makes the GH drums feel more like a real drum set. It may be unfair to compare the GH drums to the year old RB1 drums, but that's all I have available. Overall, the GH drums are extremely well made, play very naturally, and by far are the best I have ever used. Moving on, what about the guitar? Though we've had the RB1 guitar quite a while, both my son and I prefer to play on our trusty old X-Plorers from Guitar Hero 2. The RB1 guitar's strum bar is a bit soft, too mushy for my liking, and the fret buttons are right next to one another. I really prefer to have a space between them, since tactile clues help with accuracy. So what about the GH WT offering? Unsurprisingly, it feels like a direct upgrade from the X-plorer, and totally different than the RB1 axe. The strum bar for the GH WT controller is quite large, and still somewhat clicky . Another new feature is the biggie-sized "star power" button right under your palm, which is nice if you don't like to tilt your controller or hunt for the start button. The whammy bar is almost comically large, and gets in the way a bit. The fret buttons have spaces between them, like the GH II controller. This guitar is quite a bit larger than the X-plorer, too. The biggest new feature for the GH WT guitar is the touch pad on the neck. The touch pad has two basic uses. You can tap the pad instead of strumming. This is very cool, and a good change of pace every once in a while. Of course, it makes you feel like a real virtuoso, shredding like mad. You can also slide your finger over the pad instead of using the fret buttons during solo sections. This is quite similar to moving up the neck to play the solo parts in Rock Band with the RB guitar. I found the touch pad to be quite hard to control for these solo sections, to be honest, and swapping back to fret buttons quickly after a solo section isn't easy. The touch pad isn't nearly as reliable as the strum bar for strumming, either. It's a nice new feature, for sure, but, like the RB1 controller's upper neck buttons, I doubt that I'll use it regularly. For any music game, the most important question is, how about the song selection? The Guitar Hero World Tour list doesn't disappoint. Some classic rock tunes like "Hotel California", "Ramblin' Man", and "Sweet Home Alabama" are winners. There's a good selection of heavier stuff as well: "Hey Man Nice Shot", "BYOB", and "Crazy Train" will bring the house down. And finally we see some true Guitar Heroes:Jimi Hendrix and Joe Satriani. Why it took them so many GH games to get these two in, I don't understand. There's a good selection of more popular stuff too, like "Eye of the Tiger", "LaBamba", and "Beat It". (One nice moment: during the guitar solo in Beat It, the singer does all of the King of Pop's signature moves. Very cool.) All told, it's a good selection of tunes, with something for everyone. However, there is one blemish to the otherwise excellent song list: many songs that are already available in Rock Band are included in Guitar Hero World Tour. A good chunk, about sixteen of GH WT's 80+ tunes, are repeats from the competition. I've got to admit this was a real disappointment for me. Even worse is the incompatibility with previous Guitar Hero games. With the exception of the Metallica "Death Magnetic" DLC, there's no way to play GH II or GH III content in GH WT. I know the import feature for Rock Band 2 is quite exceptional, and so is the compatibility with RB1 downloaded songs. But the fact is, the bar has been raised. Not having to swap discs is a huge boon. There are songs from all previous Guitar Hero games that I want to play in GH WT, just like I can play my favorite RB1 songs in RB2! Even if they don't have vocal or drum tracks, they should be available. Importing previous GH songs seems like a win/win: reward longtime fans of the franchise and keep sales strong for older games in the series, too. Backward compatibility in rhythm games is now one of the most important features, in my opinion, and Guitar Hero World Tour suffers for the lack of it. So, what about the gameplay? As you would expect, it's pretty much the same thing as Rock Band. The difficulty is quite a bit harder, though not to the extreme of the difference between last year's rhythm game offerings. Triple notes are here, and more complex than ever. Guitar Hero masters will be pleased with the difficulty. The overall experience remains a bit more arcade-like, and over-the top than that of Rock Band. One nice new addition for bass players is the open strum note, which spices up the bass experience and gives it a uniqueness compared to the guitar track. The touch pad makes for an awesome thumb slap for bass, too! The drum experience is not what you'd expect. Deploying Star Power is accomplished by hitting both cymbals at the same time. That sounds easy enough, but it's almost impossible to do that without breaking your note streak and multiplier. The Rock Band method, fill sections, is more fun and flows better. There are freestyle fill sections in GH WT too, marked by a wavy grey line. The line is a bit hard to see, and blends in with the symbols on the background of your note track. For some reason, freestyle sections are quiet, and hard to hear, no matter how hard you bang on the drums. I played drums on medium, and found the total experience to be a bit, well, boring. There are very few patterns to learn, and they repeat ad nauseum . You'll hit red and yellow all the time, orange and purple rarely, and once in a blue moon a green or blue note will go by. Why have five pads when you don't use them? I hope it's different on harder difficulties, but the fact is the note chart is repetitive. Check out this video of "On the Road Again" to see what I mean.